...but if you're wondering which version to get now, the Director's Cut stands as the definitive adaptation of the Watchmen graphic novel by Alan Moore and Dave Gibbons. Don't get me wrong: I loved Watchmen when it came out in theaters (read my original review here). But having watched the Director's Cut three times now, I cannot help but believe that had the studio execs let Zack Snyder release his original vision from the getgo, that Watchmen would have performed substantially better at the box office. As a huge fan of the book, I had to applaud all the new additions that the Director's Cut brings to the Watchmen film. The flashback sequences, apart from Sally's, are each greatly extended. Jon's memory of the Comedian during the Vietnam War particularly stands out: I love the shot of the helicopter as it flies past Jon, with Eddie hanging on from the outside and opening fire on the Vietcong... and then landing and roasting one poor schmuck with a flamethrower (after igniting it with his cigar, how cool is that?). Rorschach gets much more dialogue - most of the new stuff being lifted straight from the book - and action. I don't recall the scene where he retrieves his equipment and his "face" as being in the theatrical version, but it's in the Director's Cut. The scene where Dr. Long is trying to talk with Rorschach in prison also has more to it. We see Jon teleport everyone out of the studio following the disastrous television interview. In his flashback on Mars we see Jon inscribing the hydrogen atom symbol on his forehead, and we also find out how the United States government determined that Jon was on Mars (via satellite telescope) when the theatrical edition never bothered to explain that. But by far the biggest and most welcome - if also the most heartbreaking - new thing that Watchmen Director's Cut brings to the table is the death of Hollis Mason at the hands of the Knot-tops. Most of the scene is done from Hollis's point of view, as we see him fighting the costumed bad guys from his younger days as the original Nite Owl... and then the film juxtaposes the villains of that more innocent time with the unrestrained depravity of the modern day street gangs. All while the Intermezzo from Cavalleria Rusticana plays during the scene. That was a tragic but appropriate detail, if you've read the Under the Hood excerpts from the Watchmen graphic novel. It's not long after that when we see Dan, as the second Nite Owl, hear the news of Hollis's death while he and Rorschach are at the tavern and then vent his rage on an innocent Knot-top. Both scenes are brutal to an extreme that has never been witnessed in a comic book-inspired film before (incidentally, there's also far more gore during the assassination attempt on Adrian, and during Rorschach's killing of the child murderer). To sum up: Watchmen Director's Cut feels like the complete and defining vision of Watchmen. There's a refinement and exposition here that was missing from the theatrical run, and I found myself "buying" the world of this alternative 1985 far more easily than I did when I first saw the movie in March. The film doesn't feel overwhelmingly lengthened, in fact I thought the new material made the time watching the movie go by even smoother. 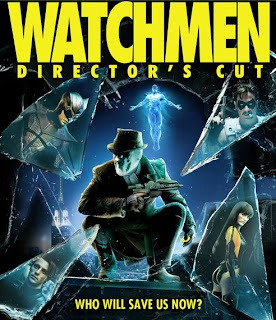 I'll give Watchmen Director's Cut a very high recommendation for your DVD or Blu-ray collection.